We had our short crochet break last month but I really don't stop crocheting. #crochetaddict I tried to crochet bows and butterflies. I already took step by step photos of how to crochet a bow and I'll share that soon here. Meanwhile, if you remember I have already made a crochet mini top hat headband. 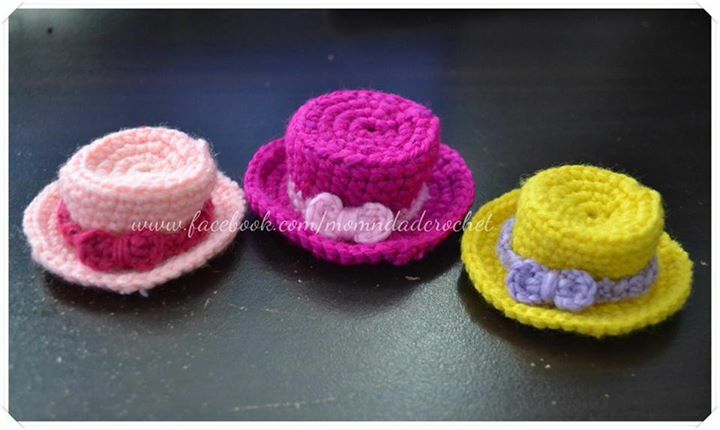 This time I try to make mini hats with bow. Here they are! These are just small hats, around 2.5-3" in diameter, which can be attached to an alligator clip or a headband/elastic band. R1. Ch1. 8sc into the ring. Pull the magic ring to tigthen. Sl st.
R2. Ch1. 1sc in the same st, 2sc in each st around. Sl st.
R3. Ch1. 1sc in the same st, *(2sc in next st, 1sc in next st). Repeat * around. Sl st.
R4. Ch1. 1sc in the same st and around. Sl st in back loop only. R5. Working in back loop only. Ch1. 1sc in the same st and around. Sl st.
R6-10. Working in both loop. Ch1. 1sc in the same st and around. Sl st.
R11. Working in front loop only. Ch1. 2sc in the same st, *(2sc in next st, 1sc in next st). Repeat * around. Sl st.
R12. Working in both loop. Ch1. 1sc in the same st and in next st, 2sc in next st, *(1sc in next 2sts, 2 sc in next st). Repeat * around. Sl st.
R13. Ch1. 1sc in the same st and around Sl st. Fasten off and weave ends. R2. Ch1. sc in next st. Turn. Repeat R2 until you get the desired length (circumference of the hat top). Fasten off. Leave a tail for sewing. Ch3. Sl st to form a ring. Ch2. Ch2. Make 2dc into the ring. Ch2. Sl st into the ring. (1st side of the bow). Fasten off. Leave a tail for sewing. Attached as shown in the photo. You may crochet flower instead of bow. 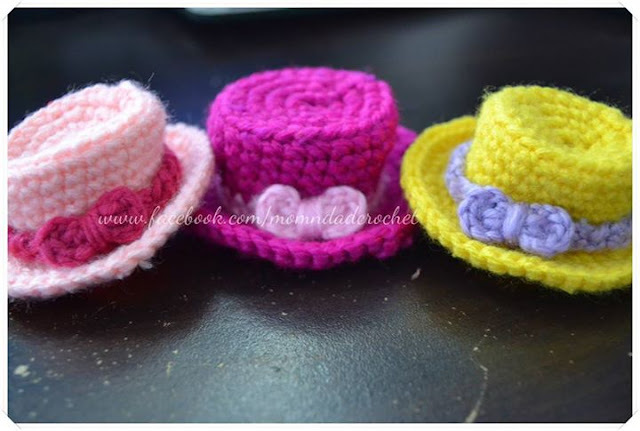 These mini hats can be attached to a clip or headband. To view more of our creations, please visit Mom and Dad Crochet and you may place your order(s) at Momaye's Shoppe on Facebook. P.S. : The pattern above is based on the mini top hat pattern I found at Ravelry. I just modified it. Credit goes to the designer. I was so inspired by your photos on FB that I want to do it soon. I'll look up on your tutorials for beginners.